How to get rid of stubborn stretch marks? This is the most common question asked by many new moms. Stretch marks also known as striae distensae often develops during pregnancy. Some people welcome them and some feel embarrassed of them. Apart from pregnancy, it can also be developed due to an imbalance in cortisol hormone levels in the body. This happens during puberty and sudden weight loss or gain. Not only women, men are also susceptible to develop stretch marks. Generally, when the skin gets stretched, the collagen weakens. Collagen is a protein that holds skin tissues together. This results in the formation of lines. To be honest fading away stretch marks is near to impossible. But the appearance can be reduced to a great extent with some remedies. There are many creams, microdermabrasion technique and laser therapies available but home remedies like cocoa butter, coconut oil and egg white are considered safe and much effective. Here in this article, we will provide a detailed description on egg whites for stretch marks. Is Egg White Really Good for Stretch Marks? Egg whites are rich in protein which helps the skin to regenerate. It contains collagen which reduces the appearance of stretch marks. The amino acids present in the egg white restore the smooth and youthful appearance. The anti-oxidants present in it fight free radicals. It contains vitamin A which enhances the elasticity of the skin. 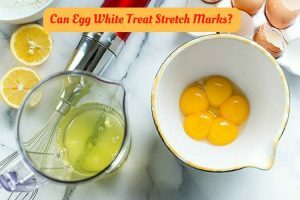 There are different ways of using egg white for stretch marks. We have mentioned them in detail below. Choose any method as per your interest and try it out regularly to reduce the appearance of stretch marks. For this process, you will need 1 or 2 egg whites. Take the amount as per the affected area you want to apply. Gently whip egg white until soft. Using fingers or makeup brush, apply it over the stretch marks. Leave it on for 15 minutes or until it completely dries. Massage a small amount of moisturizer preferably natural moisturizers like coconut oil, almond oil or cocoa butter. Olive oil contains phytosterols and polyphenols which improve the production of collagen and increase the elasticity of the skin. Massaging with the mixture of egg white and olive oil improves blood circulation and boosts fast healing. Mix it with enough amounts of olive oil. Whisk it well to achieve a creamy consistency. Apply it over the stretch marks and leave it for 20 minutes. Repeat the process once in 2 – 3 days. If the smell of egg white doesn’t go even after rinsing then apply any moisturizer like cocoa butter, almond oil or shea butter. Lemon contains natural bleaching properties which lighten the appearance of stretch marks and scars. If you have a sensitive skin then it is better to avoid this process as the acidic nature in lemons can cause irritation. Combine 1 egg white and enough amounts of lemon juice. Whisk the ingredients well for a few minutes. Apply the mixture over the stretch marks. Repeat the process 3 times a week until you achieve the results. Combine 1 egg white, 4 tablespoons of each lemon juice and honey. Whisk all the ingredients until you get a creamy consistency. Apply the cream on the stretch marks. Leave it on for 20 minutes and rinse off with warm water. Repeat the process daily for at least 30 days to see the results. Don’t scratch the stretch marks as it can worsen the skin. Don’t apply any of the above remedies if you cuts, bruises or wounds. If the application of egg white is causing burning sensation, redness or rashes, then avoid using it further. The above methods can be applied during the third semester of pregnancy to prevent stretch marks. Egg oil can also be used from the third semester to prevent pregnancy. Moisturize the stretch marks daily. Natural moisturizers like coconut oil, shea butter or olive oil. Avoid caffeine and aerated drinks as it leads to dehydration. Practice yoga or similar exercises during pregnancy to strengthen the skin. Did you find this article helpful? If you have any other secret remedy that worked for you, write to us in the comments section below. You have to make a fresh mixture every time you try the remedy. Do not store the mixture as it becomes stale easily and effectiveness reduces with time. Thank you for this post. Can I leave the mixture on my skin overnight? Up to how many days can i see some improvement??? Hw many times a day can I repeat the process? Or is it once a day? which method would you say is most effective and do these remedies work on old stretch marks?